First, wash the potatoes and poke them with a fork 2-3 times. Then wrap them in a moist paper towel and cook them in the microwave for approximately 5 minutes. Some microwaves have a specific "baked potato" setting. After they are cooked, cut them in half. Scoop the center of the potato out, leaving only the skin with a small amount of potato inside just to keep the shape. Place the skins on a glass baking dish or cookie sheet and set the skins aside. Cook the lean, ground turkey in a skillet until golden brown. Drain, add 2-3 tablespoons of water and mix in 1/2 packet of taco seasoning. After it's fully cooked, set it aside and begin working on the mashed potatoes. Put potato that you scooped out into a medium saucepan. 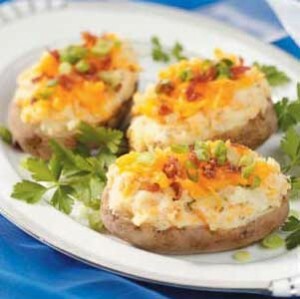 Add milk slowly, while stirring and mashing, until you've reached the consistency you desire for your mashed potatoes. When your mashed potatoes are done, set them aside as well. Now you can start building your potatoes. Scoop the cooked lean turkey into the half potato skins. Then add a scoop of mashed potato on top of the turkey. Lastly, sprinkle shredded cheese on top and place in the oven. Bake at about 275 degrees for approximately 5 - 10 minutes, or until cheese is melted. Makes 4 servings (8 children's servings). Serve alone, with extra mashed potatoes and lean turkey on the side or with a mixed green salad. Sprinkle chives, a pinch of bacon bits or a little more turkey on top for added flavor! Each potato has approximately 250 - 300 calories and about 5-7 grams of fat, depending on the size of the potato and amount of cheese used. Kids love it and, with total prep time of less than 30 minutes, parents do too!